Gold-tone stainless steel case with black leather strap. Fixed bezel. Black dial with gold-tone hands and white index hour markers. Minute markers around outer rim. Date display at 3 o'clock position. Three sub-dials displaying 24 hour, 30 minute, and 60 second. 2nd and 3rd time zones on rotating discs, 4th time zone with seconds rotating disc. Quartz movement. Mineral crystal. Push/pull crown. Case: diameter 57mm thickness 14mm. Band: width 24mm. Pin buckle. Water resistant up to 30 meters/100 feet. Functions: hour, minute, second, date, chronograph, dual zone. 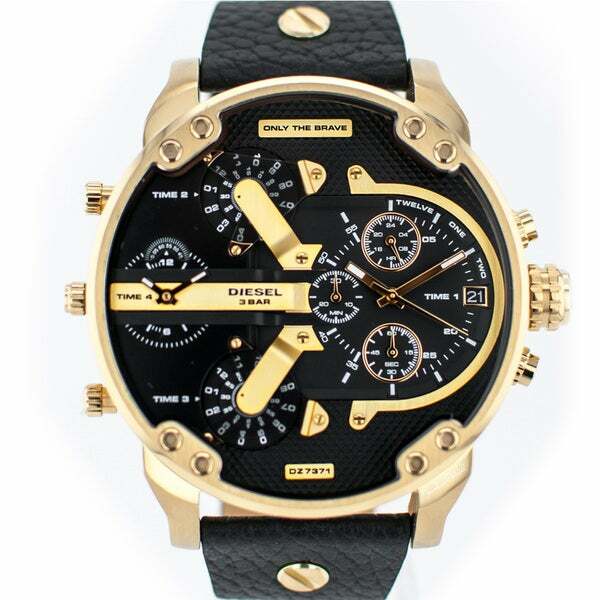 Diesel Men's DZ7371 Mr Daddy Dual Zone Chornograph Black Dial Black Leather Watch. Dimensions Case: diameter 57mm thickness 14mm. Band: width 24mm.